Veni, Vidi, Vici." - I came, I saw, I conquered. 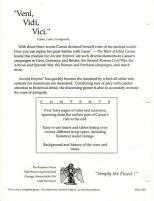 With those three words Caesar declared himself ruler of the ancient world. Now you can replay his great battles with Caesar: The Wars of Julius Caesar. Inside this module for 'Ancient Empires' are such diverse elements as Caesar's campaigns in Gaul, Germany, and Britain, the Second Roman Civil War, the African and Spanish War, the Roman and Parthian campaigns, and much more. 'Ancient Empires' has quickly become the standard by which all other rule systems for miniatures has been measured. Combining ease of play with careful attention to historical detail, the discerning gamer is able to accurately recreate the wars of antiquity. 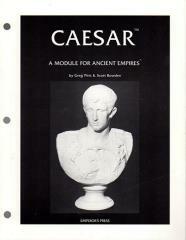 - Over forty pages of rules and scenarios, spanning from the earliest part of Caesar's rule to the end. - Easy to use charts and tables listing over twenty different troop types, including historical leader ratings. - Background and history of the wars and times.